Teaching Ages 5-Adult. All Abilities. Click on Calendar, it shows openings. I’m located in Columbia, IL. First lesson visit is free. 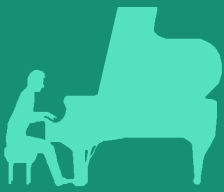 Helping piano students understand music is our passion. Best contact is: email or phone. Fill out the form and we will contact you. The First Lesson Visit is Free. Teaching hours are reserved for student learning. We respond before or after the teaching hours listed below. Click the times on the calendar to see lesson openings. Thanks for filling out the form, we will contact you soon. #1: Clavinova Festival, December 2018 - Lorelei, you are the Halvorson Music Studio Student of the month for December. You finished your entire Christmas book before December and I only assigned it to you at the end of October. Fantastic work and playing! It is so fun to hear students who make this much progress so quickly. Lorelei is in the 0-3 year, beginning stage, of piano studies and doing a great job! #2. Clavinova Festival, December 2018 - Page, super job playing this level 5 piece. You have only been in piano a little over a year! With not much time in lessons, Page learns a lot. She listens and works at home to improve each piece. That is why her ability level is at the 2-6 year stage of lessons with only a little over a year of lessons. #3. Clavinova Festival, December 2018 - Hektor, you were very brave to play at the Clavinova Festival when you knew people may clap for you. Facing your fear of applause was hard, but you did it. I recorded this at my studio so people could hear how well you can play this with less than a year of lessons. He is in the 0-3 year, beginning lesson stage of piano lessons. Hektor really enjoys playing piano. He jumps up and down when he finishes something because he is so exicited.